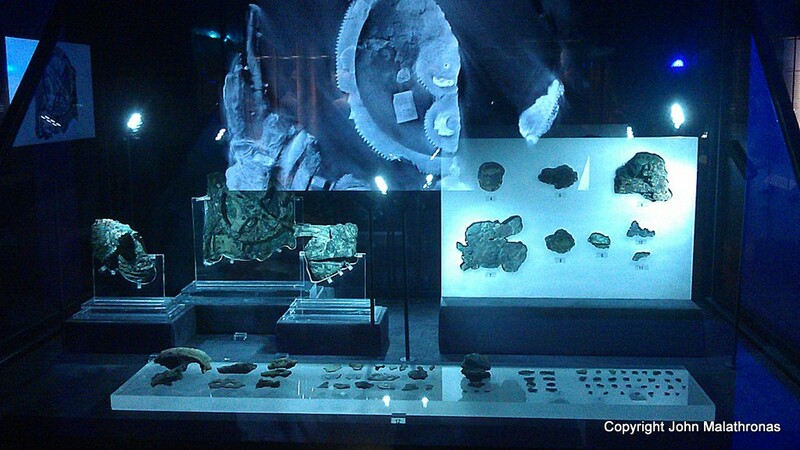 If you are in Athens this summer, stop by the incredible exhibition at the National Archeological Museum showing objects recovered from the famous Antikythera wreck. This was a ship which sailed from the land which is opposite the island of Mytilene in Asia Minor (today’s Turkey), passed through the strait between the island of Antikythera and Crete, very likely on its way to Italy. It has been dated to around 30-40 years before the birth of Christ. We know from Cicero that wealthy Romans were in thrall to Greek luxury items and ships such as the chartered wreck made the trip from Greece to Italy for that purpose. [Click on images to enlarge; please note that they have been taken by smartphone so there is some graininess involved]. The wreck was first discovered in November 1900 by sponge divers from Symi and the statues and bronze items were hauled up over 10 months using no technical assistance but the courage and determination of those divers. 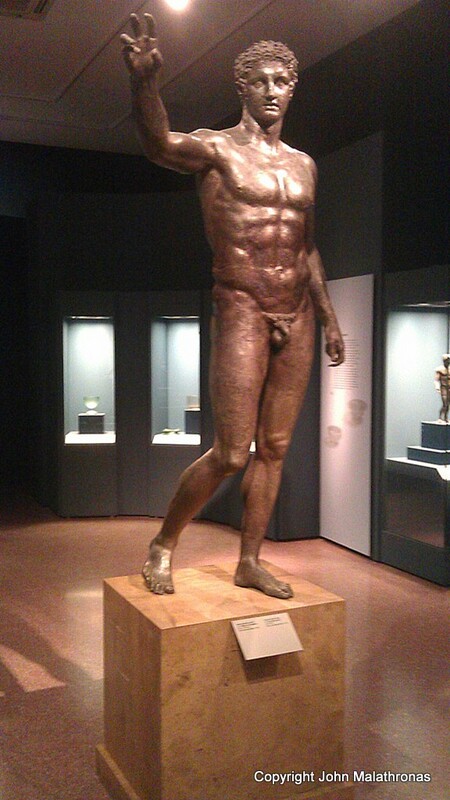 At the time, the focus was on the remarkable bronze called the Youth of Antikythera, which is displayed in the exhibition. It predates the wreck by a couple of centuries (340-330 BC). 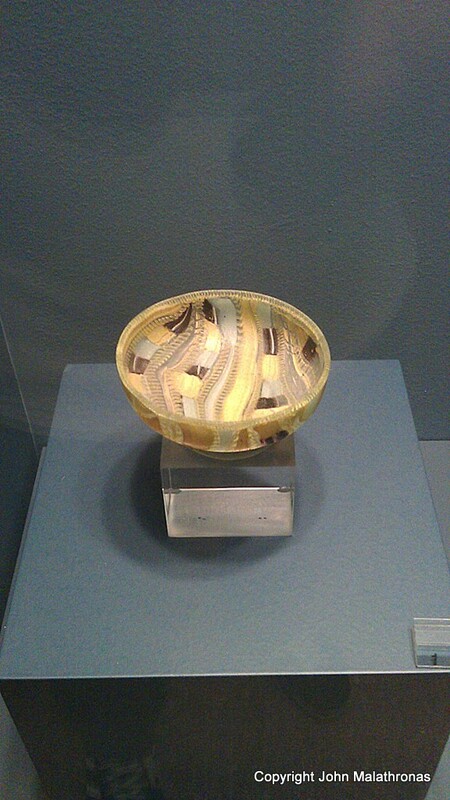 It is a product of the Classical era, so it is an antique going to Italy bought by wealthy Romans. People have speculated it is the god Hermes holding a caduceus or Hercules holding a club. To me it looks like an athlete holding his prize, and that’s what I’d like to think. 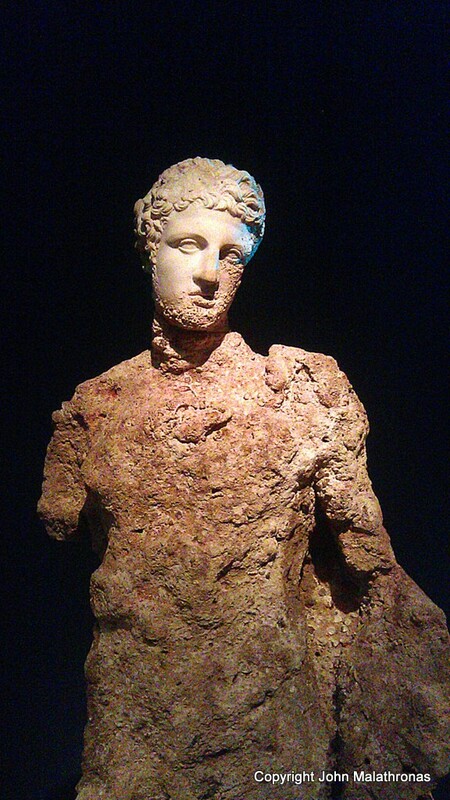 There are marble statues, partly corroded by the sea; but the bits that were covered by sand have remained intact. Here is a sample in increasing order of intactness. 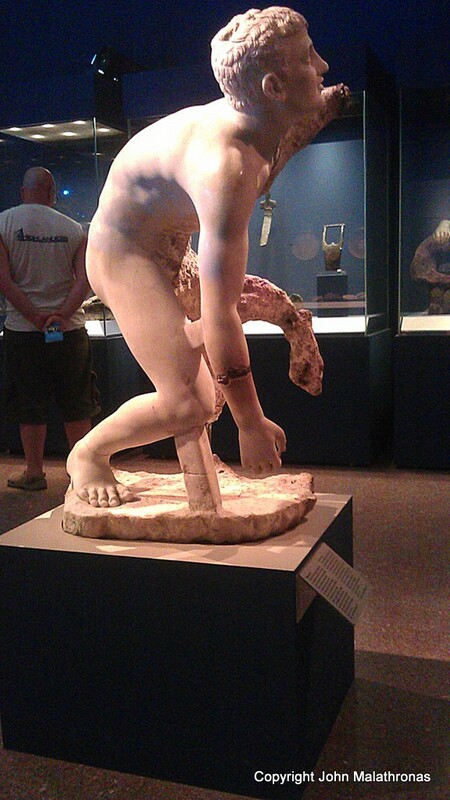 Statue of Hermes made with Parian marble. 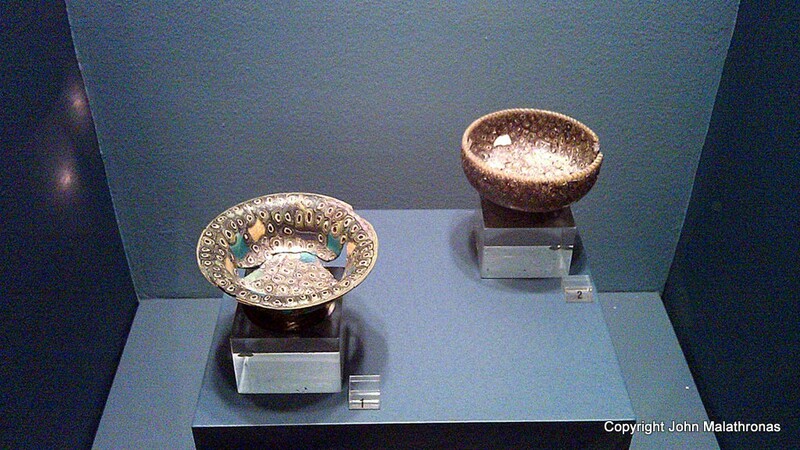 There were glass objects, too, that look remarkably modern. But that wreck contained something stunning. 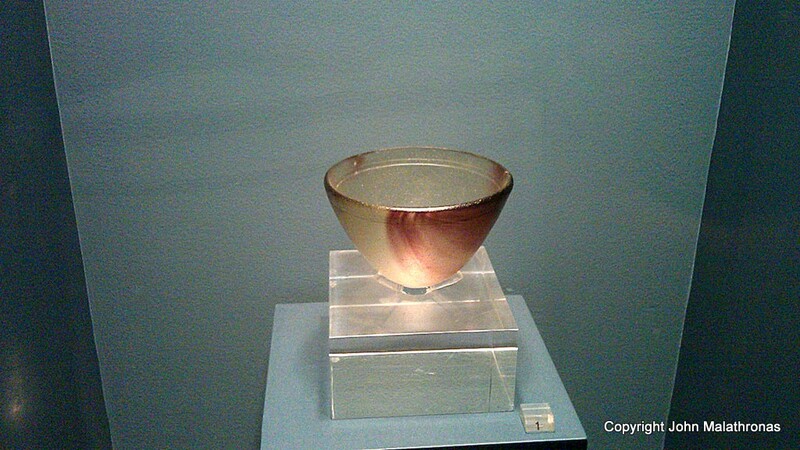 It is much, much later that archeologists recognized what they had in their hands. 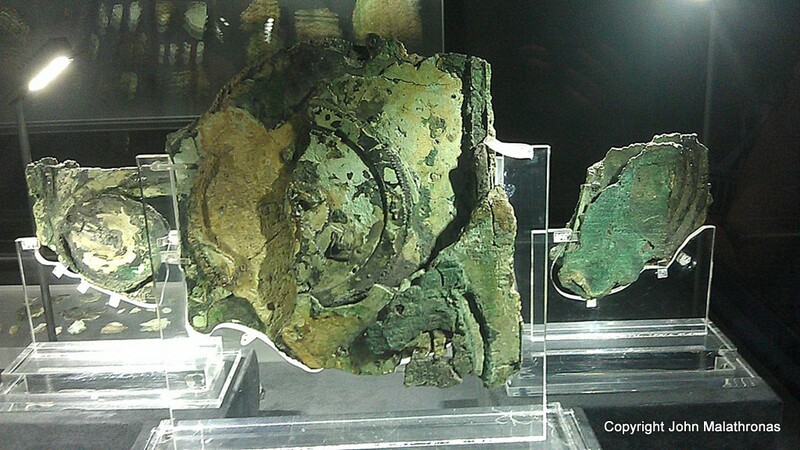 The centrepiece of the exhibition, taking up one whole room is the remarkable Antikythera Mechanism, a gadget of the Hellenistic, pre-Ptolemy period with a series of concentric gears and scales which changed our understanding of the Ancient Greek World. It is more than an astrolabe; it is as close to an ancient analogue computer as there can be, and it has astounded scientists with its watch-like gear system. 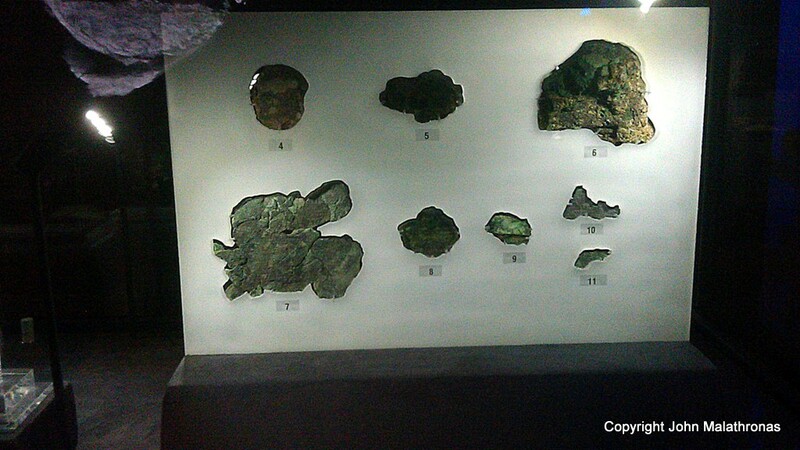 The exhibition shows the seven main large fragments and 75 smaller ones, as well as examples of reconstructions, explanations of the various gear mechanisms and an introduction to Hellenistic science. The crucial fragments are C and E and it is those that completely flabbergasted the scientists. Fragment C contains the months of the Egyptian Zodiac as well as the months of the Greek Zodiac, while Fragment E contains the crucial number ΣΛΕ (=235) which corresponds to the 19 years of the lunar metonic cycle, used to predict lunar eclipses. Just the detective work of putting (and reconstructing) the mechanism is worth a book – and many have been written. In short, this mechanism, which shows lunar cycles, Olympiads, as well as sun and moon positions in the zodiac is equivalent to 14th century Central European clocks. It is fifteen centuries ahead of its time. Why did we lose this knowledge? My opinion is that such a mechanism was not considered practical in the Roman mind which dealt with the war effort and civil engineering rather than sky gazing. So to the Monty Python question: what did the Romans ever give to us? They may have given us much but, in dismissing theoretical pursuits, they may have put us back 1500 years. 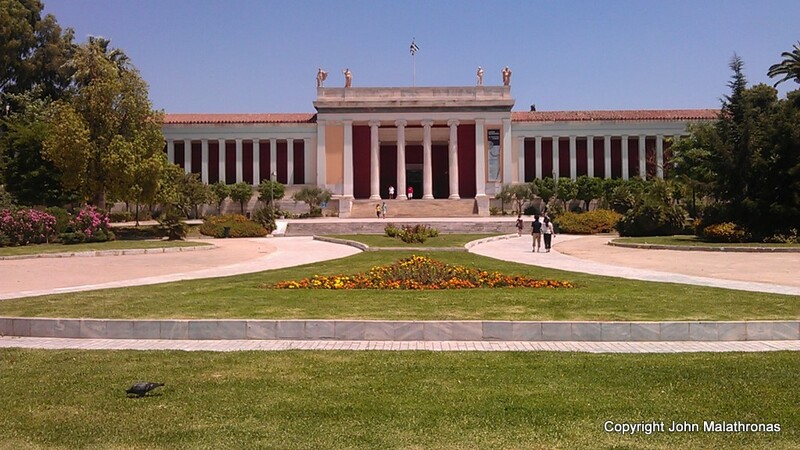 hey very interesting post i like the story of that ship next month on my Athens visit i surly gonna observe this museum, Thank you very much for this post…I enjoyed reading it. Thanks – appreciated. However, you have to be quick. The last I heard was that the exhibition last until 31 August.